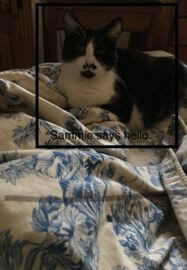 I purchased my first FELIWAY product in 2011.My cat Samantha (Sammie), a twelve year old sweetie, was in deep grief over the loss of her brother Slim. We both were. In trying to help her, I turned to the internet and there was FELIWAY. It had 5 star reviews and testimonials, mainly for correcting bad behaviors. It worked evidently, so I thought, maybe if I ordered the starter kit it would help Sammie come out from whatever furniture she was hiding under and help her to start eating. Within 5 minutes of the pheromones wafting into the room, she walked out and sat down right under the bottle - literally under the outlet. That was 7 years ago. She will be 19 this year on Mother’s Day! When our collie suddenly died in our home 3 days before Christmas, in 2005, Sammie stood on top of Patsy for a half hour, before we had to take Patsy to our vet. The reason I bring this dog story into this is to confirm what many of us know about cats, and others don’t. They have deep emotions, send body language messages to us, and experience trials and tribulations just like us. 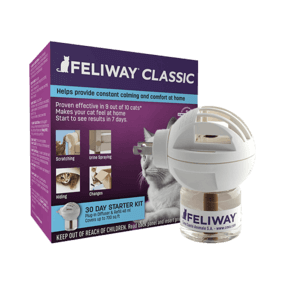 That there is a product like FELIWAY which helps them through their trials and tribulations is such a blessing. Thank you FELIWAY!